The issue of quality criteria of banknotes, of course, is not as relevant as, say, their quantitative expression. However, it will be interesting to understand which metals and alloys used for the production of small change coins throughout their use in Russia. For centuries the metals for coins were the most different. Since the beginning of the eighteenth century, this used three main metal – first, of course, gold, silver, and copper. Beginning in 1828, they joined the ranks of platinum. However, platinum coins lasted very long. Already in 1845, they ceased to produce, and which was withdrawn from circulation. Until 1926, no changes in the release of small change occurred. In the same year replaced the copper coin in aluminium bronze. Silver money was issued until 1931, and then they were replaced by cupro-Nickel. From this we can say, began a new era of production of coins in which the precious metals are fully replaced alloys from non-precious metals. The alloy is called aluminum bronze (95% copper and 5% aluminum) was used for the minting of coins in denominations of one, two,three, five cents for 26-57 years of the twentieth century. The main advantages of these coins is that they were harder than their copper predecessors. Latunevoe coins were cast from copper alloy with zinc. They, too, were quite solid, but less resistant to mechanical than coins made of aluminum bronze. The brass alloy was used in the USSR since 58 up to 91 years of the last century for the production of coins are in denominations of one, two, three and five cents, and in 1991, brass cast desjatilopastnye coins. In 92-93 years of the late 20th century brass produced fifty - and hundred-ruble coins. Since 1997 there have been latunevoe coins of ten and fifty cents, and this alloy is now used in bimetallic ten-dollar coin. Cupronickel is an alloy of copper, zinc, Nickel in the ratio 3:1:1. This alloy is very resistant both chemically and mechanically. In the period from 31 to 57 years of the last century it was used for the coinage of ten-, fifteen - and dvadtsatiletnej coins. 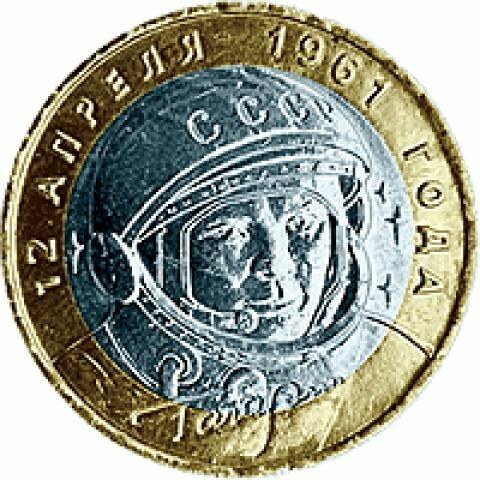 Since 1997 – for coins of one and five cents for pyatirublevye. Copper-Nickel alloy is less resistant than the Nickel silver. It was used for the production of coins of ten, fifteen, twenty and fifty cents and ruble coins in 58-91 years of the 19th century. In the period 92-93 years of this alloy coins were minted in ten, twenty, fifty and one hundred rubles. Since 1997, Russia has released from this alloy coins in denominations of one and two rubles. Now release the steel-clad coins of ten and fifty cents (steel coated copper alloy), and have a ten-electroplating of brass coins of the same advantage one, two and five rubles, Nickel-plated. Turning in the ninety-first in the USSR was first released bimetallic coin - desyatirublyovka. Unlike bimetallic coins that their outer part and the inner insert are made of different alloys.